The pretty town of Padstow is the starting point for this walk. 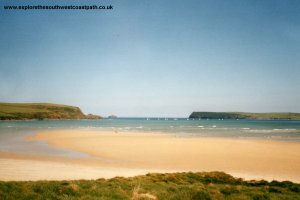 The walk runs next to the River Camel, giving views of Rock and Polzeath across the river before coming out onto the coast. 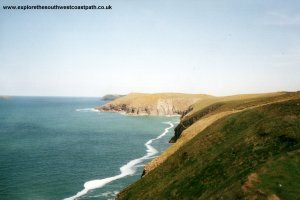 The coast path passes the excellent beaches at Trevone, Harlyn Bay and Mother Ivey's before rounding Trevose head, from where there are excellent views around the coast. 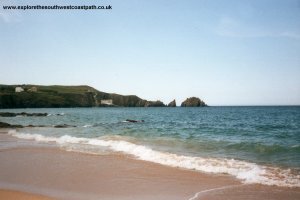 Once round Trevose Head it is a short walk to the excellent beach at Constantine. Padstow is on the A389, which connects with the A39. 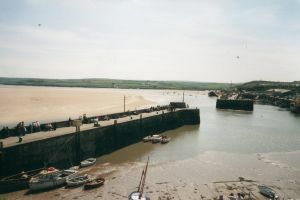 Padstow is easily accessed from the A30 and A38. There is a large car park to the North of the harbour, by the old station. By public transport, bus service 55 (operated by First Western National), runs hourly from the Bodmin Parkway Station, Bodmin and Wadebridge to Padstow. Through rail tickets are available via Bodmin Parkway station on the main line from Plymouth to Penzance. The service is less frequent on Sundays. There are also local bus services from Newquay and Newquay Airport to Padstow and from Truro to Padstow. For details of these bus services please see the links below. There is a good range of accommodation in Padstow. 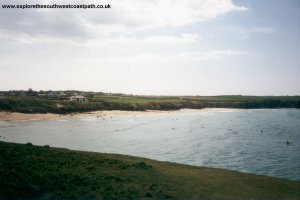 There is also a limited choice of accommodation in Trevone, Harlyn and Constantine. 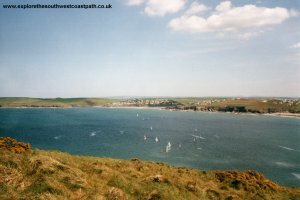 There is a tourist information centre in Padstow (on the harbour, near the coast path), that has full lists of local accommodation. For more information, see the links below. 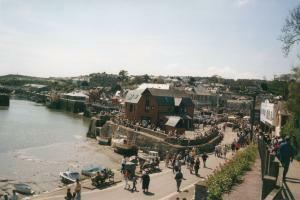 Padstow is a pretty fishing village, with quite a few shops and restaurants in the town centre. 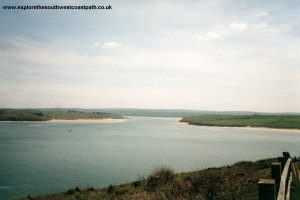 There are also boat trips available and a ferry across the Camel Estuary to Rock. 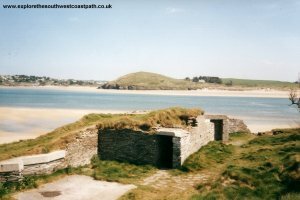 Padstow is also the start of another footpath, the Camel Tray, which runs for 17 miles over the old railway line to Wadebridge and Bodmin. 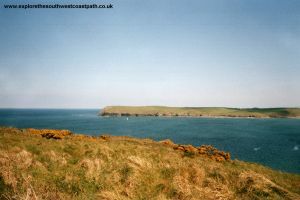 The coast past starts from the North Side of the harbour by the Tourist Information Centre - the path is well signed and follows the hill round up to the War Memorial. From here, cross the style and head North. 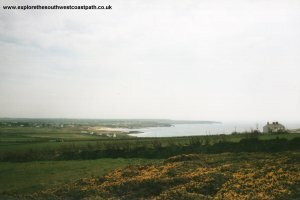 The coast path goes past some old coast guard cottages then on past Gun Point, where there are the remains of some buildings. Shortly past Gun Point the path turns to the left and you can then get down onto the beach at Harbour Cove. 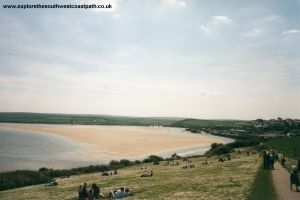 This is a good beach, with plenty of Sand, backed by Dunes and since it is on the river estuary the sea is very calm. After Harbour Cove you pass the small beach at Hawkers Cove where there are a few houses. 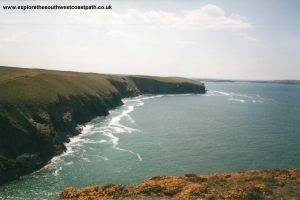 Then the path heads north to Stepper Point. 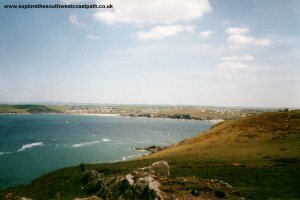 There are excellent views from here round the coast towards Constantine and to Polzeath across the river. 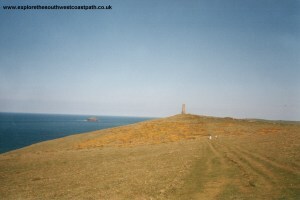 As you round the headland there is an old day mark tower. 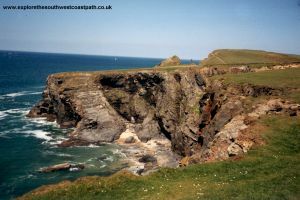 The path rounds the collapsed caves at Pepper Hole and Butter Hole - both are very spectacular, especially in rough seas. 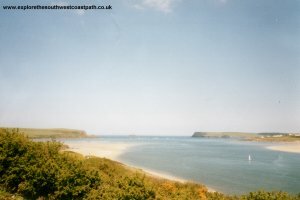 There are also views in land an up the Camel Estuary and back to Padstow. It's fairly easy going from here into Trevone, passing Porthmissen bridge. 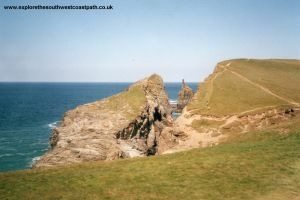 The rock formations are spectacular here, particularly when looking back towards Gunver head. 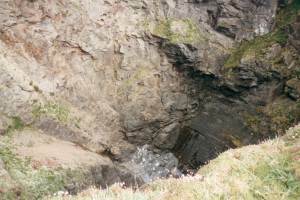 As you round the cliff into Trevone there is a collapsed cave (shown as Round Hole on the map). This is impressive, as it's in the middle of the headland - you can walk right round it. At high tide, the sea crashes into the bottom of the cave. There is no fence around the hole, so take care when walking around it, if it is slippery. Trevone has a very good beach (which has a seaside award). Although quite narrow it has lots of sand (although it is small at high tide), and like most of the beaches in this area, is popular with surfers. It has life guards on duty during the summer months. There are a couple of shops, toilets and a pub in the village. There is a small stream flowing down onto the beach, but it is very shallow to cross. 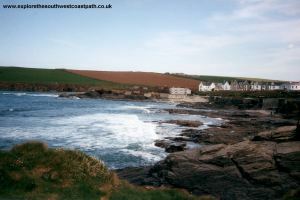 The coast path rounds the back of the beach, past some houses to another more rocky beach behind. The path goes along at a low-level at the back of the cliffs around here. There is a small section where the path has collapsed into the sea and you need to walk along in the edge of a field - but it is well signed and easy to find. 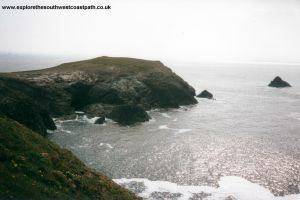 You pass the rocky cliffs at Newtrain bay before coming round a grassy headland into Harlyn. 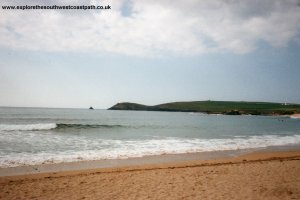 Harlyn is another excellent beach (again, it has a Seaside Award), this time very wide, with golden sands, clear sea and some large waves. There are lifeguards on duty during the summer. There are some dunes at the back of the beach and rocks further round. There is a pub and toilets in the village. 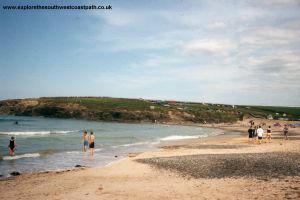 The fields behind the beach become a car park in the summer, so this beach, like many of the others, tends to get very crowded in the summer months. 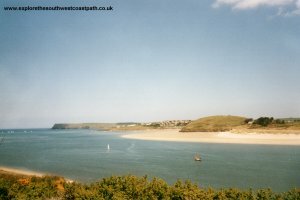 The coast path goes along the back of the beach for a short while and over the road bridge (over the steam) as you leave Harlyn. 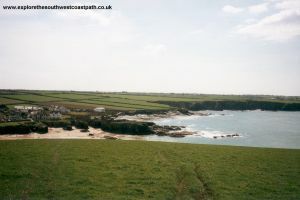 It is a flat and relatively easy walk from Harlyn to the next beach - Mother Ivey's. The cliffs are low and pass a couple of tiny sandy beaches before arriving at Mother Ivey's. Mother Ivey's is another excellent beach, again it is sandy with large waves. The sand does slope steeply though, so the sea gets deep quickly and means the waves tend not to break until they get to the beach. There is a large caravan park behind the beach, but the lack of a car park means this beach tends not to get as crowded as the others. 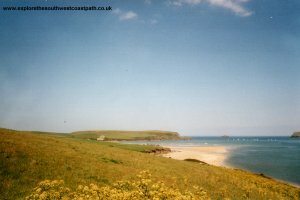 As you leave Mother Ivey's bay, you can see over Trevose Head to Constantine Bay, but don't be tempted to take a short cut, as Trevose Head is worth exploring. 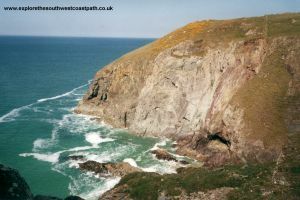 The coast path goes round the low cliffs at Mother Ivey's bay, but sadly the beach at the life boat station is not accessible, and the whole area is fenced off. 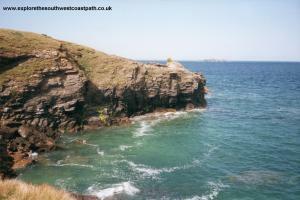 There are access roads to the lifeboat station on the headland, but they are rarely used. 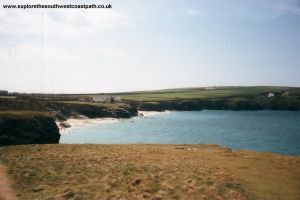 You can re-join the coast at Cats Cove, then round Trevose Head to see the light house. The light house cottages are still lived in, and the light house can be visited. 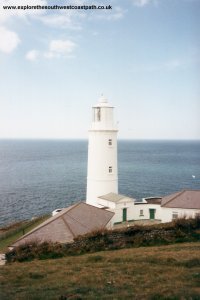 Pass the light house and you come to an area where there is a small headland. The cliffs here are unusual, and look as if they may have been quarried, but I'm not sure if they have been or not. 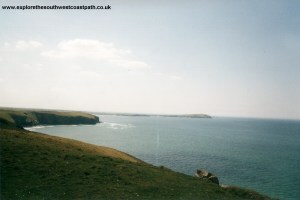 The view from Dinas Head is quite spectacular, and you can see round to Newquay in the distance. 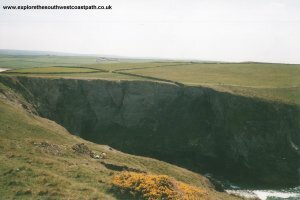 As you pass the headland there is another Round Hole very similar to, although larger, than the one at Trevone. Once past the round hole it is a flat and easy walk to Booby's Bay. There is sand here at low tide, but it is rocky at high tide. The beach is popular with surfers. 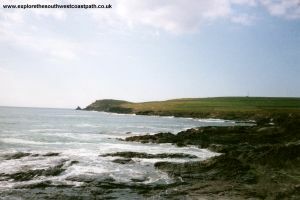 It is a short walk from Booby's Bay to Constantine Bay. 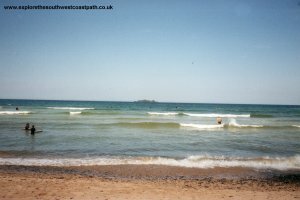 Constantine Bay is another excellent beach (another Seaside Award holder), wide with soft sand and backed by sand dunes (unusual for the North Cornwall Coast). There are rocks at either end of the beach. Unfortunately, strong currents are common here, so sometimes bathing and surfing are banned (check the warning notices). There is lifeguard cover throughout the summer. There is often a refreshment van on the end of the beach in the summer months, otherwise you will need to walk into the village to the surf shop. There are toilets at the car park at the back of the beach. 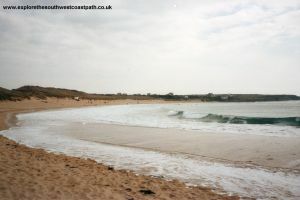 If you are returning to Padstow by bus, the bus departs from the Constantine Bay Surf Stores a little distance in land. Western Greyhound operate a bus service between Constantine Bay and Padstow, running approximately every two hours (including Summer Sundays). The bus departs from outside the Constantine Bay Surf Shop, it reverses in the lay-by outside the shop. This is where the telephone is marked on the map. 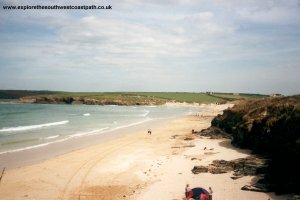 The bus also stops at Harlyn and Windmill (the south end of Trevone Village, a short walk to the beach), if you prefer to walk this part of the path in sections or spend a bit more time on the beaches. The stop in Padstow is by the old station, to the south of the harbour. This bus also goes to Newquay (and the airport) in the other direction. For more information on the bus service, see the links below, or call 01637 871871. Ordnance Survey Landranger map 200 covers this area of the coast path and is available from most book shops nationwide. It is also stocked at the Tourist Information centre in Padstow. Multimap is a web site which provides maps of the UK. 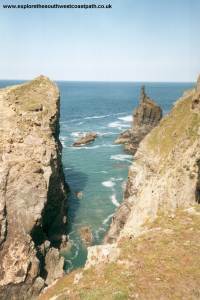 The links below will be of most use to the coast path from Padstow to Constantine Bay. 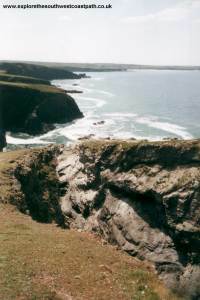 These maps join to provide the complete coast path between Padstow and Constantine Bay.